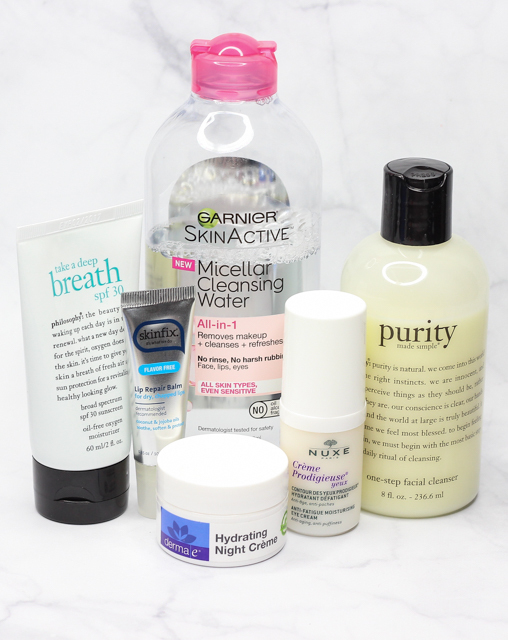 My skin has always been pretty troublesome-prone to acne, dull, uneven, sensitive, dry, oily. You name it. But recently, I have noticed that most of the skin concerns I typically deal with, aren't really so troublesome anymore. For instance, my acne has significantly lessened (I get maybe one or two spots every now and then), my complexion is a bit brighter and much smoother these days, and my skin is more resilient and not super sensitive like it used to be. I want to share with you all a couple of my favorite skincare products that have been rocking my world lately. I like to think that these items have contributed and helped in some way, when it comes to the current state of my skin. Philosophy Purity Made Simple One-Step Facial Cleanser: This cleanser is an old favorite that I am happy to have rediscovered. It's super gentle, and it effectively removes dirt, oil and makeup without stripping the skin. After use, my face feels amazingly clean, smooth, and hydrated. Love using this with my Clarisonic Mia. Power duo! Garnier SkinActive Micellar Cleansing Water: Before going in with Philosophy's Purity Made Simple, I like to start the cleansing process with Garnier's Micellar Cleansing Water (review). It's a great multi-purpose product that does a nice job at removing makeup-no rinsing required, and it refreshes my skin like nobody's business. Derma E Hydrating Night Crème: My routine was slacking a proper night cream, and this one from Derma E is a very welcome addition. It's moisturizing, rich but lightweight, and it smells amazing. This night crème helps hydrate and reduce the signs of aging thanks to ingredients like vitamins c and e, and Hyaluronic Acid which helps skin retain moisture. I received this Derma E Hydrating Night Crème in a Target Beauty Box a few months ago, but I am totally purchasing the full size once I am done using this one up. Which probably won't be for a while since a bit of product goes a long way. Also, this sample jar is very generous. Philosophy Take A Deep Breath™ Broad Spectrum SPF 30 Sunscreen: This moisturizer is a new addition and so far, I am really enjoying it. It feels comfortable and lightweight on the skin, and it plays well under makeup. I love that this is paraben and oil free, and the SPF of 30 is great since it helps protect against UVB and UVA rays. Nuxe Crème Prodigieuse® Anti-Fatigue Moisturising Eye Cream: I was on the market for a new eye cream and this one from Nuxe has been a real treat to use. It contains hyaluronic acid, plant oils, and vitamin e, to help minimize puffiness and the look of dark circles. It also combats signs of aging and protects the delicate skin against oxidative stress. Nuxe's Crème Prodigieuse® Anti Fatigue Moisturising Eye Cream feels light on the skin, and hydrates really nicely. My eye area feels and looks so refreshed whenever I apply this. Love! SkinFix Lip Repair Balm: I just can't get enough of this lip balm. My dry and parched lips quickly do a 360 whenever I coat them with the SkinFix Lip Repair Balm. It's super moisturizing, lightweight, and feels so lovely on the lips. This lip balm is made with natural ingredients like coconut and jojoba oils, and it's paraben free. What skincare products have you all been loving?